Matt C: Even if you've been living under a rock recently there will have been no escaping the unprecedented (and deserved) success of the Black Panther movie after it captured the zeitgeist in a way that took almost everybody off guard. 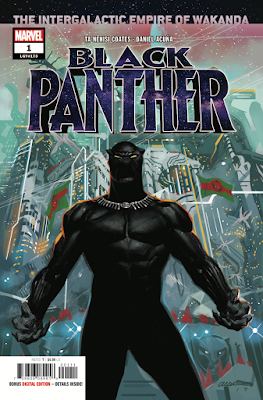 That success won't necessarily translate across to world of comics but, although I didn't really connect with the previous Black Panther series, this new relaunch has me intrigued as it expands outwards across the multiverse to encompass the 'Intergalactic Empire of Wakanda'. Moving over to Image, if you've seen the teaser for the Deadly Class TV series that appeared last week, and are looking for a 'jumping on point', then issue #34 most definitely won't be it. This violent, emotionally-charged drama is really in full swing and your best bet is to seek out the first trade and dive in there - you won't be disappointed. The rest of us can wonder how Rick Remender and Wes Craig manage to keep things so intense from issue to issue. Also from Image, Days Of Hate #5 will continue to lead us through a very frightening version of the near future, Further Adventures Of Nick Wilson #5 will wrap up this look of how we attempt to grow old without letting our past define us, and Barrier #4 finds us at the penultimate chapter of this beguiling tale already. A fine selection of books to go home with this Wednesday. Jo S: A little raft of last-but-ones carries my pull-list aloft this week; I suspect I’ll be mourning the passing of a few favourites at the same time in a month or so, but let’s not be sad about that yet! Gorgeous Legenderry: Red Sonja, resplendent, glamorous and feisty in steampunk finery, is my first pick of the penultimates, ably supported by Motherlands, a novel mother-daughter-interdimensional-bounty-hunter-odd-couple series which has seen some iffy patches but still fights back. Weird mutated superhero The Beef reaches four of five this week too - I’ve been employing James R’s recommendation of using a translation app to read the Spanish language sections of this properly: comic books go a long way to escape the constraints of language but it’s nice to get the subtlety of the dialogue as well as the broad understanding inferred from body language and context. I also made use of this app in the first couple of issues of Barrier (also now heading into its last-but-one), where the creators used difference in language to deliberately separate characters but issue #3 was completely word free (wow!) - Vaughan and Martin derive eloquence from unexpected sources. Reaching its last issue too soon for me is the Further Adventures Of Nick Wilson: this has been delicate, sensitive, subtle and touching - a real surprise winner for me - and, thankfully with plenty still to come, Ales Kot’s Day Of Hate is up too; it thrums with tension and torn loyalties - this one heads to the top of my pile every time. Wrapping up with two new series: a fearsome new Black Panther sees T’Challa travelling the multiverse to visit outposts of the Wakandan empire and the Hunt For Wolverine: Mystery In Madripoor takes some of my favourite X-Men to this infamous island after a sighting of Patch suggests they might find Logan in the ill-reputed vicinity. This is going to be a great bank holiday weekend!